In the words of Ron Burgundy, we need all of you to stop what you’re doing and listen. We’ve just been handed a very urgent news story. You can now perform image editing within Yodeck! As the old adage goes, a picture is worth a thousand words. This is especially true with digital signage. That’s why we are always looking for ways to improve how you manage your images in Yodeck. And we think our latest awesome enhancement will do the trick. There is actually no trick about the reason why we have focused on image editing in our latest software update, which is now live. Now you can edit your images within Yodeck as many times as you want. 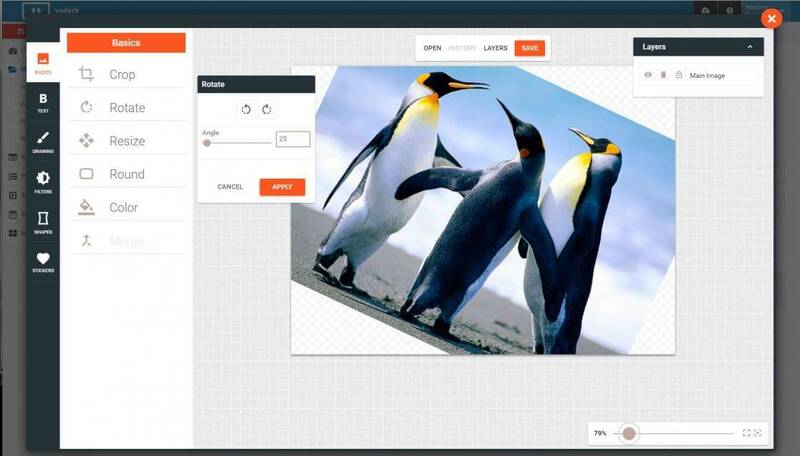 Indeed, editing images within the Yodeck portal is something we’ve always wanted to add. And now it’s here, but also with a special twist. Not only you can now retouch any images you have uploaded, but you can also easily modify later any layers you add or use. For example on a digital menu board setup, you can add texts with your prices or specials, and change it each day within minutes, without ever leaving Yodeck! That’s not all, however. As well as the new image editing feature, there are also some new media encoding enhancements, and an easy way to duplicate your media within Yodeck. And because Halloween is just around the corner, there are a whole host of nice new tricks (of the good, useful variety) as well as treats. You can now edit all Images within Yodeck. Any changes made are preserved as layers, so that the saved picture can be easily modified again in the future. We upgraded our Encoding service. It is now much more fair across Yodeck Accounts, more robust and can easily be scaled, if needed. Enabled new Azure IoT Hub Integration on a select set of Players. This is a large-scale test to make sure everything works great. You can now Reboot your Players (needs Azure IoT Hub Integration above to be enabled for your account though). Media Folders are now always sorted alphabetically. Added separate mass-action buttons (Edit, Delete) for all listings (Media, Widgets, Playlists, Shows, Schedules, Monitors). Support for the on-chip Watchdog feature of the Raspberry Pi. If the device gets frozen, it will reboot automatically. Improved the scheduled downtime in-app message. Along with the date/time, it now includes the timezone and the expected duration of the downtime window. Added a “Duplicate” button for all media types. All “Duplicate” buttons now directly open up the new copy’s editing form, so that you can make changes directly to the new copy. You can now disable buffering for Streaming Videos, to reduce latency (but decrease stream playback stability as a trade-off). We updated wpa_supplicant, the WiFi management software we use in Yodeck, to protect against KRACK attacks. Updated wpa_supplicant, the WiFi management software we use in Yodeck, to protect against KRACK attacks.